Nowadays we are living a digital life, where people are surrounded with various type of electronic devices. Smartphones are one of them. People like to get touched with their beloved one through various type of communications. And messaging is one of the best and easiest ways of communication. 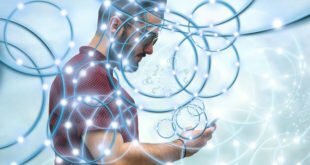 For your better experience of messaging, our expert recommends you The 10 Best Messaging App for Android Smartphones and Tablets. It would be a great movement of your messaging experiences. There are so many messaging apps available in the app store. So you have to choose wisely, on the base of your need. Otherwise, you might get irritated, and you could have face problems. Chomp SMS, one of the best messaging app all around the world. Chomp SMS offer you almost all the features you need for messaging others. It has a huge collection of emoji and themes. You can also customize your unique look. They have good privacy option like passcode app lock. On the other hand, it has unlimited customization options. It allows you customize notifications icon, LED colors, background, ringtones, font size, font colors, and wallpapers. At the same time, it offers Push bullet and Android Wear compatibility. The fabulous design and lots of options help GO SMS Pro to took place the list of the Best Messaging App for Android. It comes with beautiful themes, stickers, emojis, private box and pop-up blocks. Currently, it has more than 100 million users all around the world. Using GO SMS Pro is simple, intuitive and fun. Finally, GO SMS Pro has a unique feature called by ‘Delay Send,’ if you send something unusual, you can fix it. WhatsApp is an extremely popular messaging app all over the world. People who want a safe and secure messaging experience can use WhatsApp. It’s very easy to setup, and it’s free. For this reason, you can use WhatsApp without fear of money. The user can share photos, voice notes, short video clips and much more. WhatsApp allows you to do group chat and real-time chatting. Using tons of features, you can have a great messaging app what you want. 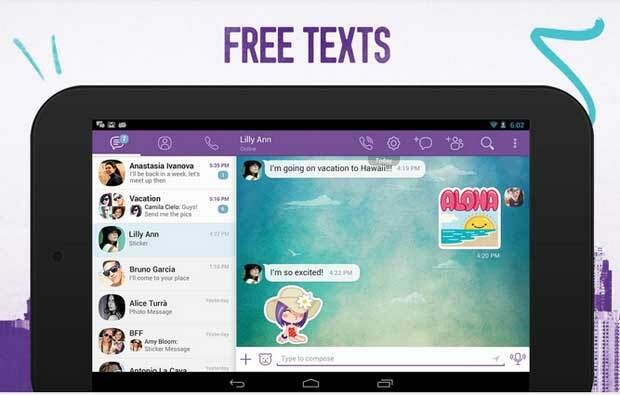 Viber is a widely popular messaging app that automatically adds your contacts and finds out other Viber users. Viber is very famous for its stickers and emojis. Easy setup, customizing options, cool features will make your messaging better than before. It also has local and international call system. You can use for call buying credit. 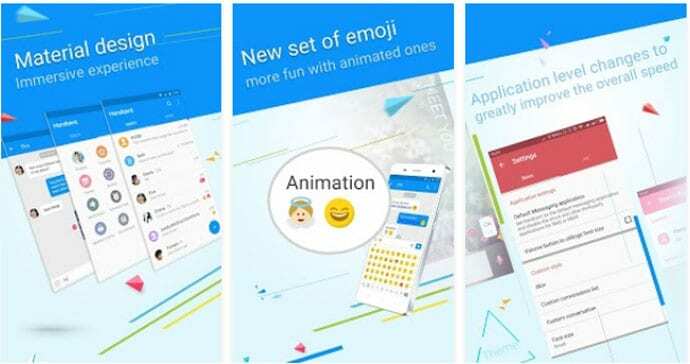 If you are looking for a simple but intelligent messaging app, then Google is offering you one of the best messaging apps for Android. No doubt about it that Google Messenger is a faster and easier messaging app for an Android user. You can share photos, voice notes and also your location. Messaging with Google Messenger is also fun with its colorful and intuitive design. 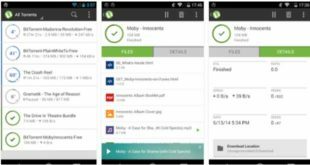 Textra is another app which has gained huge popularity with good reason. Textra SMS comes with a use of excellent material design. 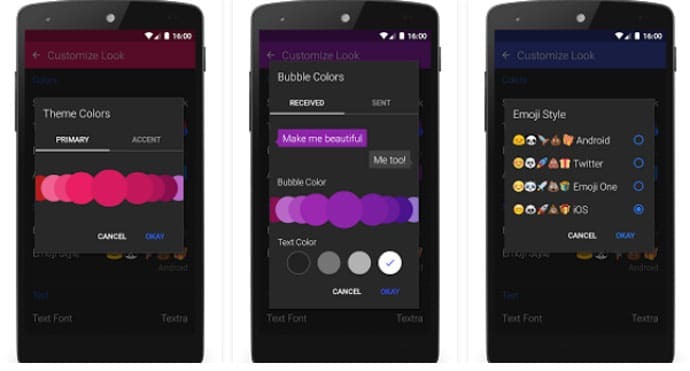 You can customize your preferred theme, bubble colors, icons, app icon, and signatures. You can fully express yourself with preferred emoji style. It has an intelligent auto mode turns on the dark theme automatically on the based on your internet time. It’s also compatible with PushBullet and Android Wear. The Line is a very popular messaging app with more than 600 million active users. It also one of the popular and well-known Text Messaging Apps for its various features. It has a unique feature timeline, where you can post and also you see your friends posts. It is very popular for its huge collection of stickers. The user can play some games and earn coins for existing stickers and much more. As a result, you can express yourself through stickers. Line user can follow their favorite celebrities and brand in Line. Line offer a group call with 200 hundred people, isn’t it huge? Yes, it’s huge. In fact, this is the maximum number of people you can tie up with a group than any other apps. 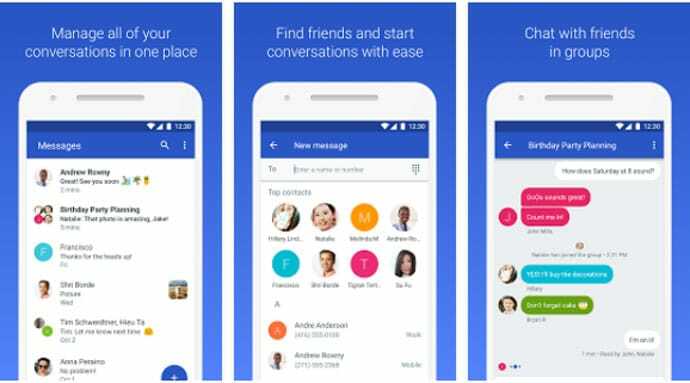 Facebook Messenger is another popular messaging apps for Android user. Currently, more than one billion people are using Facebook Messenger. It comes with tons of features. Almost everything you want for a comfortable messaging can fulfill it. Sharing photos, files, audio, video, voice notes is very easy with Facebook Messenger. You can make audio call and video call. The user can instantly login Facebook with Facebook Messenger. It’s updated almost every week for a better experience for the users. Another interesting feature is secret conversation. You can use it for an important chat. 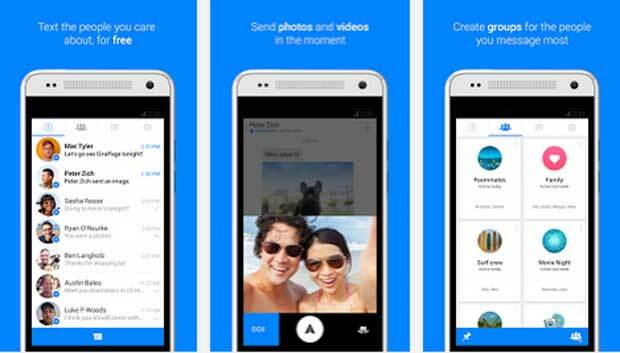 Handcent Next is another Top Messaging App for Android user. 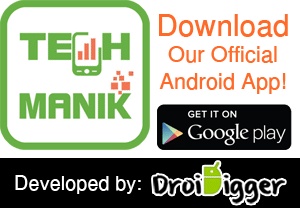 You can customize this app for your requirement. 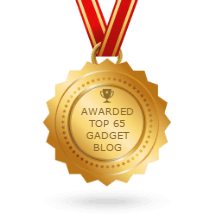 It is capable of syncing your contact with the cloud is something you could fall in love. You can also protect your conversation with a password. Handcent Next backup your SMS very quickly. The user can schedule SMS for broadcast at the correct time, like Good Morning, Good Night or Birthday wishes. Group texting, Facebook sign in for contacts, multiple language support makes it’s better for your messaging. Skype is also one of the best messaging app for Android user. Most of the people like to use it for business and professional purpose. It’s serving for a long time, and through the time people loved it very much. This one is most known for its video and voice call functionality. Without its calling system, Skype also pretty good messaging apps. 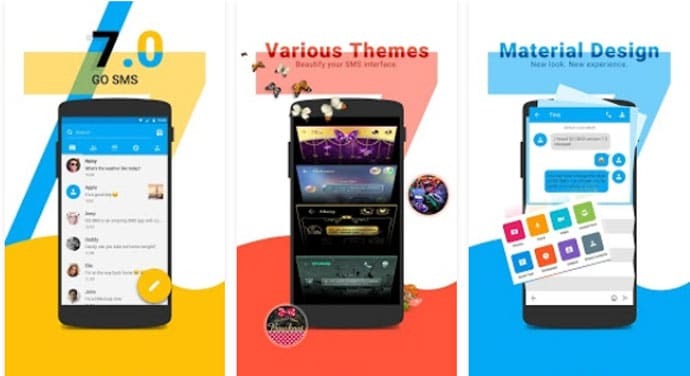 Its offer you a pretty good messaging experience with its unique style, color, and emojis. The user also can get a reminder about friends birthdays. You can use Skype credits to call mobile and landlines. 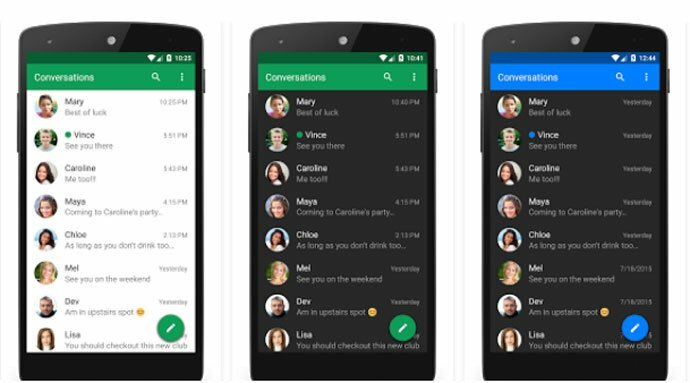 These are the Best Messaging App for Android user. Choose your favorite one and get connected with your friends and family through messaging, calling and sharing. 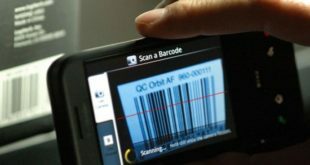 Every app has various type of features and also has unique features. You can also have a great calling feature from some apps with its messaging features. Best wishes for your better and comfortable messaging.